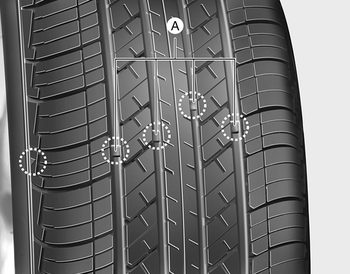 If the tire is worn evenly, a tread wear Indicator (A) will appear as a solid band across the tread. This shows there is less than 1.6 mm (1/16 in.) of tread left on the tire. Replace the tire when this happens. We recommend that when replacing tires, use the same originally supplied with the vehicles. If not, that affects driving performance. When replacing the tires, recheck and tighten the wheel nuts after driving about 50km (31miles) and recheck after driving about 1,000km (620miles). If the steering wheel shakes or the vehicle vibrates while driving, the tire is out of balance. Align the tire balance. If the problem is not solved, we recommend that you contact an authorized kia dealer. Using tires and wheels other than the recommended sizes could cause unusual handling characteristics and poor vehicle control, resulting in a serious accident. Wheels that do not meet Kia’s specifications may fit poorly and result in damage to the vehicle or unusual handling and poor vehicle control. The ABS works by comparing the speed of the wheels. The tire size affects wheel speed. When replacing tires, all 4 tires must use the same size originally supplied with the vehicle. Using tires of a different size can cause the ABS (Anti-lock Brake System) and ESC (Electronic Stability Control) to work irregularly.